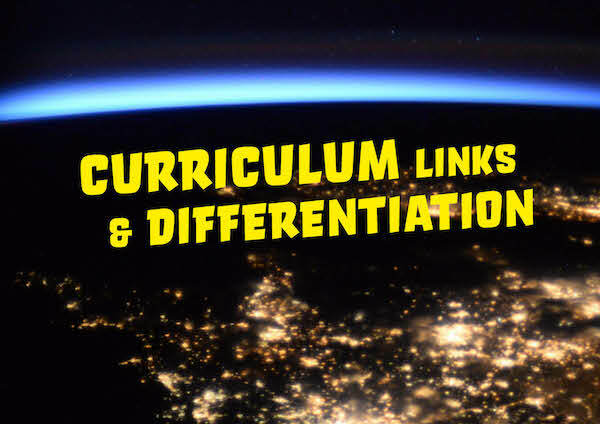 Download detailed curriculum links and ideas for differentiation for your region: England, Scotland, Northern Ireland or Wales. You can also read an overview of the subjects covered by the Space Diary programme below, then visit the Activities page to search for content by Subject. The Space Diary is made up of 7 chapters each with 3 or 4 individual activities. The activities follows the narrative of Tim’s mission, from getting ready to go to space, to launch and docking with the International Space Station, to life on the ISS, and back to Earth again. Students will learn about Tim’s mission, and about the science behind it, and we also provide many connections to life on Earth so that children can connect the learning with their own lives and experiences. The Space Diary is designed to be the main exercise book for students so they can document their learning. There are additional resources on the Learning Portal to resources on the Learning Portal (accessible only to registered users) can be used to plan your lessons and activities. We also have some extension activities for Y5-6, upper KS2 and P6-7 and we will continue to grow these resources as the programme evolves. Note that you need to be registered (free) to access the downloadable materials on the Principia Space Diary website. Description: A 5-circuit exercise workout to learn about personal health by understanding what astronauts need to do to get fit for space. Also includes counting and measuring. Description: A 10-question quiz about what happens to the human body in space. Students will learn about their own bodies and the impact that a low-gravity environment will have on the human body. Description: Students will plan and draw a space dinner using the Eatwell food plate as a guide for choosing healthy options. Learn about health and nutrition and also about how astronauts make and consume food when in space. Description: Every astronaut needs a spacesuit to keep them safe. 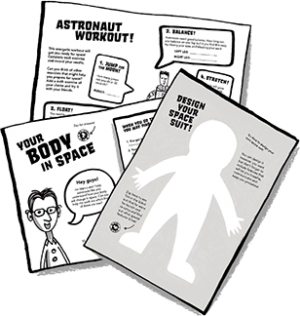 With digital and multimedia resources provided, students will research the types of spacesuits astronauts need, and the features they include, then they will design their own suit. Chapter One: Goodbye to Earth! Once your Space Apprentices are fit and healthy, they’re ready to launch into space! The activities in this chapter cover blast-off, Tim Peake’s journey out of Earth’s atmosphere and the complexity of connecting with the International Space Station. Activity 1.1: Time for Launch! Description: Using the information provided, students calculate the time each launch activity occurred and then draw that time on an analogue or digital clock. Description: Students write an emotive piece of poetry or prose after listening to astronaut Richard Garriott describe the experience of launching into space. Description: Students learn about the complex task of docking the Soyuz capsule with the ISS by tracking the path the Soyuz took. Welcome aboard the ISS! Now that your Space Apprentices are safely aboard, it’s time for them to get to know their new home. This chapter explores the ISS as a unique place where different cultures come together to advance scientific knowledge for everyone. Description: It’s time to find out about fellow astronauts and research the countries who have been to the ISS. Students will research a chosen country and create a card to highlight the key points. They will learn about how information can be presented in different ways, for example in long form or short form. Description: Students research articles and news reports from Tim’s time on the ISS, and then write their own article, reporting on an imagined incident or event. Description: Using the clues provided, students must break a code, and then decode the message written in that code. Space is full of environments to explore – both natural and manmade. This chapter gives Space Apprentices the chance to learn about the ISS and to discover the planets of our solar system, including Earth. Description: With the assistance of a teacher/adult, students read the information about the different parts of the ISS, and fill in the gaps relating to each part’s function. Description: Students begin by completing a dot-to-dot exercise, which will create a picture of the ISS. Referring to the information in Activity 3.1, students then identify the different parts of the ISS and colour them in according to the Colour Key. Description: By researching independently, or referring to the information available on the Space Diary blog, students prepare short descriptions for each planet in our Solar System. Description: By researching independently, or referring to the information available on the Space Diary blog, students prepare short descriptions for each planet. Activity 5.2 builds on the information in this lesson. The ISS isn’t just a home for astronauts – it’s the home of three major science laboratories where astronauts conduct experiments every day. This chapter asks Space Apprentices to put on their lab coats and learn about scientific methodology. Description: By researching independently or using the information available on the Space Diary blog, students identify which foods are suitable for growing in space. They then draw one of these plants, labelling its parts. Description: Students learn about how water is collected, purified and reused on the ISS. They then draw the lifecycle of a drop of water, to represent this process. Description: In this activity, students nominate a question they’d like to answer through an imagined experiment. They then determine the steps needed to conduct the experiment, forecast the outcome and draw a diagram of what their experiment would look like. Time to explore beyond the outer reaches of our galaxy! This chapter encourages Space Apprentices to think about space history and the part they could play in future exploration – as a scientist, engineer or even a space resident. Description: Students plot significant personal dates, such as birthdays of friends and family members on a timeline of space history which spans from 1950 until 2020. Description: In this activity, students consider what conditions humans need to survive, such as water, the length of day and night, climate and gravity. Students then design their space habitat, or can make a model of it with lego or craft materials. Description: Students learn about the robots astronauts use inside and outside the ISS, and on other missions. They then design their own robot to help explore a space habitat. This activity can be linked to 5.2. Now that Space Apprentices have completed their mission, it’s time to return to Earth. This chapter covers the complex task of re-entry and gives students the chance to reflect on their imagined experiences in space. Description: Students learn about the complex process of the Soyuz capsule’s return to Earth. This procedure is carefully planned to ensure astronauts’ safety. Students must find the way through the maze, avoiding satellites and space debris. Description: Challenge your students with this great map-making activity. This lesson compliments teaching on units of measurement, length and distance (cm, m and km) and will develop pupils’ understanding of the concept of ‘scale’. Description: This creative writing activity asks students to reflect on their imagined mission to space, and to write a postcard sharing their experiences.